Acrylic Product, Size: 9" To 14"
Reckoned as one of the distinguished business names, we are involved in presenting to our customers with a comprehensive array of Article Dinner Sets. We provide to our clients quality range of Dine Well Square Shape Acrylic Dinner Sets, which are finely carved from high quality raw material. Appreciated for attractive designs, patterns and shapes, these Dining Sets are crafted by experienced designers and craftsmen to give them fine finishes. - Used in houses and hotels for serving food items. Used in: Hotels, Home etc. 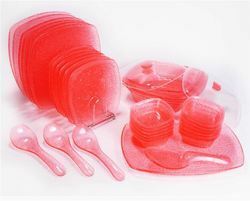 Unbreakable 35 Piece Acrylic Dinner Set. Justifying our standing in the national market, we have brought forth a commendable consignment of Acrylic Dinner Set. We offer Acrlic unbreakable dinner set in different colours and in two shapes ie. round and Square. We assures you best in quality of our products. We are manufacturer and supplier of comprehensive line of Acrylic Dinner sets, Vegetable Bowls, acrylic soup bowl, Acrylic plates, Acrylic spoon, acrylic serving trays which is specifically used by the clients in Catering. we are looking for distributors from Chandigarh, Mohali, Panchkula, Haryana, Punjab, Himachal Pradesh or entire North India.